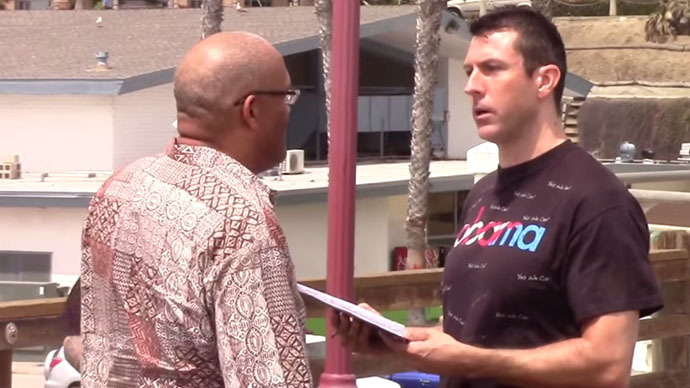 US journalist Mark Dice has asked the people of San Diego to sign President Barack Obama’s “plan” to nuke Russia to “maintain America’s superiority.” The majority of beachgoers didn’t appear to get the joke, and signed the fake petition. The “experiment” was recorded on video, whichMark Dice thenshared on his Twitter, YouTube and Facebook accounts. “This is the one way we can maintain our superiority,” Dice says. “I have been American all my life,” says the man who is signing the petition, “Let’s hope he doesn’t disappoint me,” he added, apparently referring to Obama. Another couple asked Dice if he was really thinking that the US was “going to” nuke Russia. “I don’t think we are going to,” a woman says. Despite seeming mistrustful, they signed the petition, however. The “test” was conducted amid growing tensions between Russia and the West. AP reported last week that Washington was considering withdrawing from a Cold War-era treaty with Moscow and returning nuclear-capable medium-range missiles to Europe in an effort to counter what it calls "Russian aggression." Cited by AP, the plan that it was penned by the office of US General Martin Dempsey, chairman of the US Joint Chiefs of Staff, contained several contingencies for a scenario in which a key missile treaty between US and Russia fails. Following the G7 summit in Germany, the leaders of the member states said they were ready to impose additional sanctions on Russia, if the situation in Ukraine worsens. “There were discussions over additional steps,” if Russia “doubles the aggression on Ukraine,” President Obama said. Dice, the author of several popular books on secret societies and conspiracies, is also known for other “social experiments” making fun of Americans. He previously asked San Diego, where he is based, to sign an "I Support Illiteracy" petition to "spread illiteracy" in America. A week ago, he approached beachgoers, asking them to repeat after him “I am a Zombie Who Does What I’m Told, Without Thinking.” Dice shared the results on social media. In 2013, he asked California beachgoers if they would sign a petition to support Barack Obama’s plan to repeal the Bill of Rights.